8 X Christmas wine glass charms in a burgundy organza bag. Ideal for Christmas dinner parties and any festive celebrations. Perfect for guests to identify their own glass. Also, a lovely addition to add a bit of sparkle to a gift of a bottle of wine or champagne. Made With Love Candles in Argyll Scotland. Beautiful quirky recycled wine bottles for Christmas table pieces holding dinner candles, flowers etc. Vintage Christmas doily Small Christmas table cloth hand embroidered ONE-OFF!! Small white Christmas table cloth / DOILY. Hand Embroidered, ONE-OFF ITEM! MADE OF GOOD QUALITY COTTON. PICTURES SHOW FRONT AND BACK SIDES. Artificial silk flowers with a mix of peony and roses. Available in Red and white. Ideal for Christmas and wedding table centrepiece, wedding car arrangement, hotel reception desk, restaurants, funeral receptions, or your dining/cabinet center piece. Flowers are vibrant and look real, a great looking stand out piece for any occasion. Size may vary but Maximum length 40x15x15cm Unfortunately no returns Any queries please don't hesitate to email me. BAVARIAN STYLE TABLE DECORATION. DELIGHTFUL XMAS TREE WITH MINIATURE HANGING TOYS. HAND MADE WOODEN CHRISTMAS TREE. View Our Categories. Fair Trade Handmade Felt Egg Cosy. Penguin, Santa and Frog. Halloween Bat Terrys Chocolate Orange/Bath Bomb Cover Hand Knitted Condition is New. This listing is for TWO COVERS ONLY. HANDKNITTED with black polyester wool with black glittery foam wings attached. Great for school prizes or gifts. Will fit a Terrys chocolate orange or a bath bomb. Please check my other listings and send message if you have any questions or requests. From a smoke free home. Prompt postage with Royal Mail 2nd Class Letter. Lovely addition to any Christmas table. TRADITIONAL CHRISTMAS XMAS TREE BAUBLES . WINE GLASS RING CHARMS. 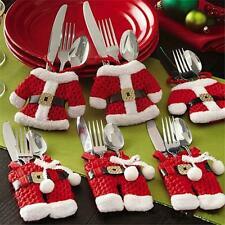 Christmas Dinner Party Table Decoration . (UNIVERSAL STANDARD FIT ALL WINE GLASS STEMS). SILVER PLATED CHRISTMAS TREE PENDANT DANGLE BEADS. Lovely floral rose decoupage bottle, romantic table piece. Many variations off decoupage listed. Decoupaged wine bottle which makes lovely table piece with dinner candle or posey. Beautiful dog/cat decoupage wine bottle, makes lovely table piece with dinner candle or posey vase. Lovely gift for animal lover. Lovely little bottle with duck detailed decoupage on front and rear. Makes lovely table pieces for dinner candles or flower posies. Beautiful handmade Shabby Chic heart Christmas garland/bunting. Garland length approx. 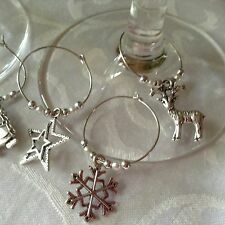 SET OF 6 HANDMADE CHRISTMAS WINE GLASS CHARMS. THIS SET OF 6 WINE GLASS CHARMS WILL ADD A COLOURFUL DECORATION TO YOUR GLASSES AND WILL MAKE A LOVELY. NEVER GET YOUR WINE GLASSES MIXED UP AGAIN - EVERYONE HAS THEIR OWN CHARM. 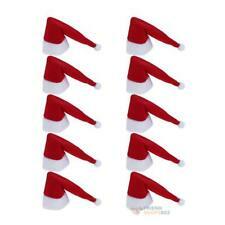 You are purchasing 24 Red Wooden Roses. The wooden roses have a multitude of different purposes such as. Although giving a realistic & delicate appearance the wooden rose is very strong,versatile & pratical & due to their individual creation/process each one is unique. Chocolate Oranges are not included. Perfect addition to your Christmas dinner table. Total Number of cards: 10. Q. I need my order urgently, can you help?. Pine cone owl on a plastic lid covered in artificial leaves and flowers. Christmas Terrys Chocolate Orange/Bath Bomb Cover Hand Knitted Condition is New. 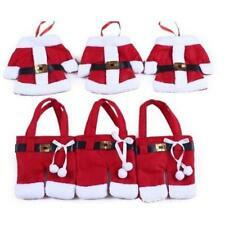 This listing is for TWO covers HANDKNITTED in polyester wool body of Santa bright red in colour. With felt yellow belt and sparkley buttons attached. Great for school prizes or gifts. Will fit a Terrys chocolate orange or a bath bomb. Please check my other listings and send message if you have any questions or requests. From a smoke free home. Prompt postage with Royal Mail 2nd Class Letter. 🍊🦄one Handmade crocheted Unicorn to cover a Terry’s chocolate orange🦄 🍊. Sparkly white yarn with pink horn, lilac heart and peach, pink and lemon curls. CHOCOLATE ORANGE NOT INCLUDED. Lot Handmade Beaded Christmas ornaments Red & Green Wreath, 4 pcs. 4 inch Artisan hand blown glass ornaments multi colored.